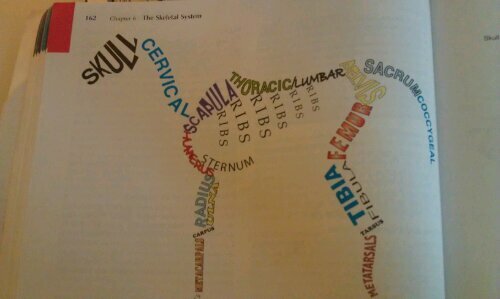 Fun with Anatomy and Physiology! A couple of weeks ago, I entered the special circle of hell known as Animal Anatomy and Physiology. The crazy thing is I was really looking forward to it. I was bored with all the introductory classes and prerequisites and couldn’t wait to finally get into something that was applicable to my job. Now I’m in over my head in exhaustive memorization. There are so many bones in the skull. Each bone in the body has different characteristics to it that articulate with other bones, are surfaces of muscle attachment. It’s a lot of information. This morning I was doing laundry and caught myself muttering “olecranon process,” because I have gone insane. By the way, that’s the fancy name for your elbow bone. My textbook is pretty dry, in fact, the subject itself is pretty dry. But that doesn’t stop the DVMs who wrote it from trying their damndest to make it fun. Initially when I saw the little jokes, I thought, “Ew, don’t you dare patronize me.” But eventually I came around and now I laugh out loud when I see them. I point at my text book and say, “Oh, you guys!” I’m sure this has something to do with the insanity. Here are some of my favorites. Any other techs out there have any more? Nope? Not funny? Well, it gets me through my day. I totally get it. I went through it for massage school. Luckily, my anatomy teacher was very passionate about her subject, and made tons of jokes and was very animated and silly and high-energy. It helped, because otherwise the whole thing felt completely meaningless and dry; I think the geeky humor of slow insanity gives the mind something to connect the various facts together. I have this same textbook, which I know because I just read the “dogions” quote the other night and remembered this post 🙂 First chapter I thought this book was interesting. I have since changed my mind.